Beautiful as usual. Thank you for sharing. Very nice bag. Great for the season. Suzie I love all your crocheting you are very talent. I also love the broom cob web duster made 1 for my self thanks for sharing. Suzie try making a swiffer duster that would be awsome then my dusting will be complete. 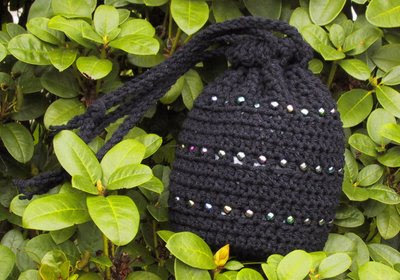 I made one of these new bags in purple with purple glass beads, stunning! I love all of your patterns! Thanks for sharing, you are wonderful!